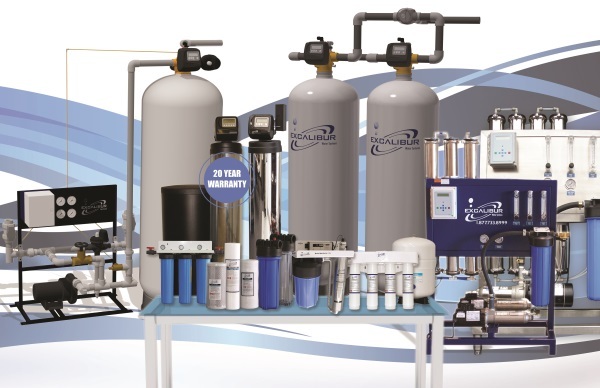 Excalibur Water Systems is a Canadian manufacturer of water treatment and purification equipment for global residential and commercial/ industrial markets. Our water softeners, water conditioners, iron filters, speciality filters, dealkalizers and side stream (cooling tower) filters handle flows from 1 to 2,000 gallons per minute (3,785 litres to 7,570 litres per minute). Excalibur Water Systems also manufactures reverse osmosis and desalination systems to 2,000 gallons per minute (7,570 litres per minute). We've invested in up-front standard engineering for our commercial/ industrial water treatment equipment products, allowing us to offer our commercial and industrial water treatment solutions at an extremely attractive price point, eliminating the need for expensive custom engineering. Excalibur Water Systems offers warranties up to 20 years. Excalibur Water Systems can solve your water problems, no matter what they are..